NEW DELHI: Indian Navy has released the Admit Card for Indian Navy MR 2019 for October Batch on Friday, March 22, 2019. The admit card for Physical Fitness Test (PFT) for Matric Recruit (MR) has been released at the Indian Navy official website – joinindiannavy.gov.in. Those who qualify Written Test are permitted to undergo PFT and only those who qualify PFT undergo Medical Examination. 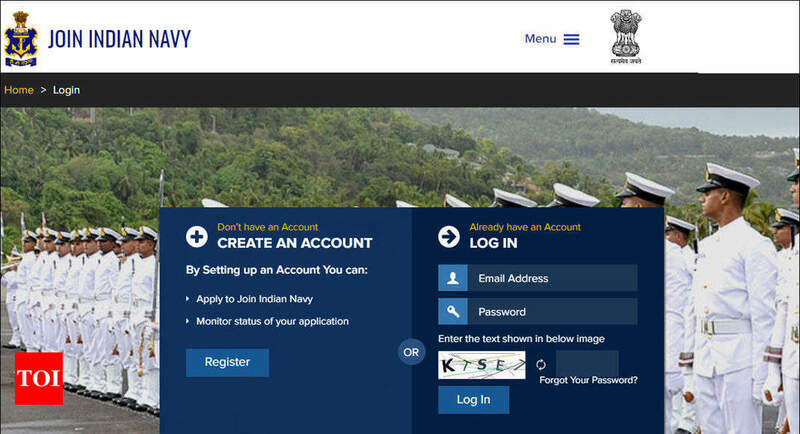 Direct link to download Indian Navy MR PET Admit Card 2019The candidates can download their Admit Card for PET through candidate login by entering email ID and password. On the admit card they will get PET date and venue information. The PFT will consist of 1.6 Km run to be completed in 7 minutes, 20 squats (Uthak Baithak) and 10 Push-ups. Candidates undergoing PFT will do so at their own risk. Candidates selected will undergo 14 weeks Basic Training at INS Chilka followed by Professional training in the allotted trade in various Naval Training Establishments. Branch/ Trade will be allocated as per the requirement of Service. The candidates may undergo various professional courses as per service requirement and certificates of equivalent qualifications from various Universities are being awarded on successful completion of courses. You will get “Graduation Equivalent Certificate” on retirement after completion of 15 years of service. Entry level Medical standards are different for different entries. Medical examination will be conducted by authorised military doctors as per medical standards prescribed in current regulations applicable to sailors on entry. Candidates declared Temporary unfit during Medicals in the recruitment medical examination can avail specialist review from the specified Military Hospital within a maximum period of 21 days. No further review/ appeal is permissible. Those candidates who are declared Permanent Unfit during Medicals can appeal for specialist opinion in a Military Hospital on payment of Rs 40 by Military Receivable Order (MRO) in the Government Treasury within 21 days. Medical fitness certificate from other than that of the specialist opinion in the designated Military Hospital will NOT be considered. This whole process is generally completed on the same day but it may also take 3-4 days depending on the service requirements or due to unforeseen contingencies. Merit List of all those candidates who are qualified in all respects will be prepared at IHQ MoD (Navy), New Delhi for different entries depending upon the numbers to be inducted. Out of this list, the centre-wise select list of candidates will be displayed in the respective Recruitment Centres. All select list candidates who are issued with a call letter for Final Medical examination will be required to report at INS Chilka (Odisha) on the specified date and time to undergo a Final Enrolment Medical examination at INS Chilka prior to enrolment. Sleeper class rail/bus fare will be reimbursed on production of the ticket/receipt on reporting at INS Chilka. Candidates found UNFIT during this medical examination will not be enrolled for training. No appeal is permitted for review after the final enrolment Medical Examination at INS Chilka. The final enrolment in the Navy will be subject to the candidate clearing the final medical fitness at INS Chilka. The candidature of candidates selected is valid for the current batch only. Merit List pertaining to the advertised batch is valid ONLY for the advertised batch. Qualified candidates whose names do not appear in the final merit list cannot claim admission for the next batch. These candidates will have to undergo the selection procedure afresh provided they meet the eligibility criteria for the fresh batch. Call letter for final medical examination will be forwarded only to medically qualified candidates in the select list. Unsuccessful candidates will not be intimated separately.